A decadent dessert, perfect for sharing. In a blender, add flour and eggs. Blend together until no lumps remain. Gradually add milk, water, salt, sugar, cocoa and butter. Blend until incorporated. Set aside. Heat a small nonstick skillet over high heat. Pour ¼ cup batter into skillet and swirl around to coat bottom of skillet. When edges start to brown and bubble, flip the crepe and continue cooking for 1 minute or until golden brown. Place parchment paper in between crepes while cooling. Prepare filling: Using an electric mixer, beat pudding mix, heavy whipping cream and Irish cream until thickened. Set aside. To make sauce: In a small saucepan, over medium heat, whisk together hazelnut spread and evaporated milk. Cook until smooth, about 3 minutes. 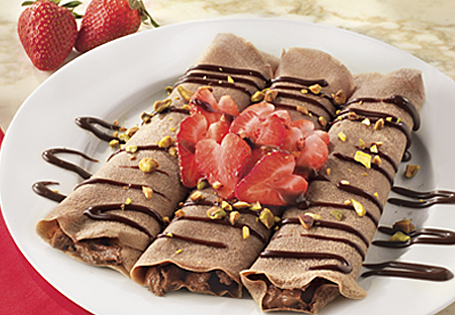 To assemble: Place a crepe on a plate and fill with 2 tablespoons of filling, roll into a cylinder or fold in half. Drizzle sauce over the top and sprinkle with pistachios.